“Shut the door; you’re letting all the hot air in!” We’ve all shouted that at a family member from time to time. But, here’s a newsflash: you’re letting in more air from outside—and letting out air from inside—than you realize. Since the average homeowner spends about $2,200 heating and cooling their home (mostly cooling for Floridians), you could be losing up to $660 a year just from air leaks alone. So air leaks=big bucks lost and mega discomfort. Well, let’s change that, shall we? We’ll give you a brief overview of how to find air leaks around your home and how to seal them. 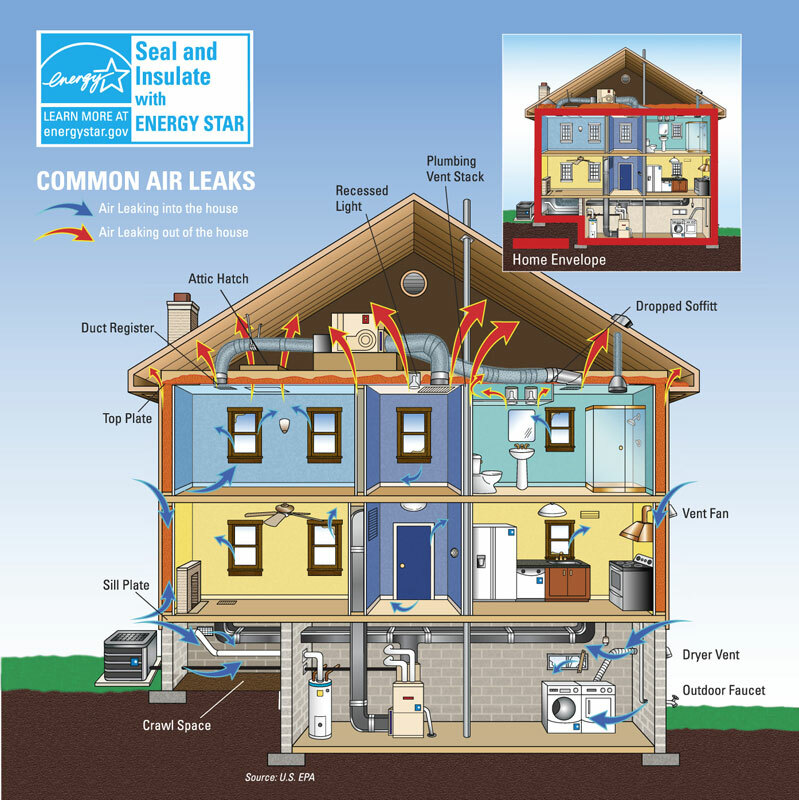 Here’s a map of common air leak areas in a home. Visually inspect the areas. A gap may be obvious at first glance. Bring a lit incense stick and pass it around the edges of common air leak areas. Do this while running exhaust fans that blow air outside (like a bathroom fan or clothes dryer). If the incense smoke waivers or is sucked out of or blown into the room, there's a draft. You can also wet your hand and put it over the air leak areas. You’ll find a draft when you feel the cool air on your hand. Shut a dollar bill on a door or window. If you can pull it out without the dollar bill dragging, then you’re losing money. Shine a flashlight at night over potential air gap areas while a partner looks from the other side. if your partner sees rays of light through large cracks, you have a draft. You can also have a professional find the air leaks in your home as part of a whole-house energy audit. Caulk is a flexible material that comes in cartridges. You apply it with a half-barrel caulking gun. Use caulk to seal small 1-inch or smaller cracks, gaps, and joints around stationary building components and materials. To find out the type of caulk you need, use this caulk buying guide from Lowe’s. The U.S Department of Energy gives tips for applying caulk. Weather stripping are strips that you’ll put between movable building components, such as doors, attic hatches and openable windows. Use this U.S Department of Energy guide to choosing weather stripping. There is another nasty internal air leak you need to be aware of—the air duct leak. This leaks out air before it’s properly delivered to the rooms in your home, resulting in uneven cooling and higher energy bills. Learn more about air duct leaks in this article: How You're Wasting 20% of The Money You Spend to Home.